Try pumpkin cream pie as a no bake alternative to traditional pumpkin pie. 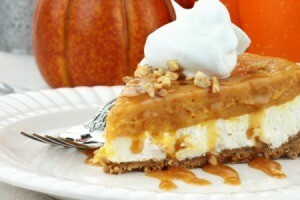 This page contains pumpkin cream pie recipes. Mix cream cheese, 1 Tbsp. half and half and sugar with wire whisk until smooth. Gently stir in whipped topping. Spread on bottom of crust. Pour 1 cup half and half into mixing bowl. Add pudding mix. Beat with wire whisk until well blended, 1-2 minutes. Let stand 3 minutes. Stir in pumpkin and spices; mix well. Spread over cream cheese layer. Refrigerate at least 2 hours. Garnish with additional whipped topping and nuts as desired. Makes 8 servings. With pumpkins so plentiful and cheap(er) in the fall, this is a good time to use pumpkin in recipes. Make this pie in advance and garnish with ruby red raspberries and whipped cream right before serving for an eye-catching presentation. COMBINE pumpkin, pudding mix, milk and pumpkin pie spice in large mixer bowl; beat for 1 minute or until blended. Fold in 1-1/2 cups whipped topping. Spoon into crust. Freeze for at least 4 hours or until firm. Let stand in refrigerator 1 hour before serving. Garnish with remaining whipped topping and raspberries. Serve immediately. The vanilla pudding in this pie helps it achieve a great flavor and texture! 1 cup pumpkin, 1/2 cup skim milk, 1 pkg. sugar-free vanilla instant pudding . . .